Hyderabad based TruJet, brand name of Turbo Megha Airways Private Limited, is India’s 9th operational private airline, the country’s third operational regional scheduled domestic airline, and the country’s second all-turboprop, operational airline. Turbo Megha Airways Private Limited was incorporated in March 2013, by three persons: Vankayalapati Umesh, Ram Charan Tej Konidala, and Ram’s sister, Sushmita Laggishetty. 46 year old Umesh, who serves as the Managing Director (MD) of the airline, rose from a ground-handling technician to running Turbo Aviation, which includes a jet charter company ‘Turbo Charter’ that owns a Cessna CitationCJ2. Turbo Aviation also offers ground handling services, CAMO services, and MRO Services. 30 year old Ram Charan is a Telugu Actor, and a director of MAA TV and reportedly owns Hyderabad Polo Horse Riding club. He and his older sister Sushmita are two of three children to 59 year old actor, producer, and Indian National Congress politician Konidela Siva Sankara Vara Prasad alias ‘Chiranjeevi’. The company had an authorized share capital of INR 15 crores (INR 150 million), which was 3 Crores more than the minimum paid up capital requirement for an airline operating turboprop aircraft of the likes of ATR 72 and Q400, or regional jets like the Embraer E170, 175 and CRJ 700 and 900. Seating capacity was hence limited to the 70 – 90 seat category. In May 2013, the airline pumped in INR 7 crores as capital, followed by another 5 crores which took the total paid up capital to 12 crores in July 2013 – sufficient to satisfy the DGCA requirement for the application of a regional permit. In July 2014 – a year later, the airline received its no objection certificate (NOC) that allowed the airline to start the process towards obtaining an air operator permit (AOP). The formal application meeting for a southern regional AOP was held on 23rd January 2015. In April 2015, the authorized share capital of the airline was increased to INR 50 crores, which can allow for a paid up capital of the same amount – the amount advised by the DGCA. This also allows the airline to apply for a pan-India license with larger airplanes. In May 2015, Prem Kumar Pandey, Assistant Vice President at Megha Engineering & Infrastructures Ltd (MEIL), was appointed as a director, with investment from MEIL. 29 year old Prem is the son-in-law of one of the promoters of MEIL. ‘Megha’ in the registered name Turbo Megha Airways Private Limited indicates that investment from MEIL was certain way back in 2013. Shareholding pattern in the airline is believed to have been restructured to stand as 22%-26%-52% between Umesh – Charan & family – MEIL, with access to around an additional INR 100 crore. The airline received its first of two ATR 72-500 aircraft on 21st May 2015. The aircraft had earlier flown for the Malaysian airline and charter operator Berjaya Air. The 6 year old aircraft MSN 858 is registered VT-TMK, and the cabin is laid out with 72 seats. A month later, the airline received its second ATR 72-500 (MSN 875). After Berjaya shut turboprop operations, both aircraft were purchased by Singapore based Phoenix Aircraft Leasing, and were sold to Ireland based Elix Aviation Capital Services in December 2014. Elix has dry-leased the airplanes to TruJet. The same lessor has leased airplanes to Bangalore based Air Pegasus, which is a smart move as it helps transfer assets between operators should either shut operations. The airline received its AOP on 7th July 2015, less than a year since obtaining its NOC, and around one-and-a-half months since receiving its first aircraft, making it the fastest regional Indian airline to obtain its AOP. Turbo Aviation’s experience with running a charter service which resulted in good preparedness, and the airline’s connections in the ministry are believed to have speeded up the process. Trujet is an interesting name considering the airline operates turboprop aircraft for now. However, it must be borne in mind that a turboprop engine’s core is a jet engine. Usually, airlines take about a week to open for bookings once the AOP is received. Once bookings open, an airline starts operations usually 2-4 weeks thereafter. This allows sufficient bookings to build up before operations can commence. In the case of Trujet, the airline wanted to cash in on the Pushkaram festival, an Indian festival dedicated to worshiping of rivers, once every 12 years. The airline started operations with one aircraft on 12th July, flying between Hyderabad, Chennai, Tirupati, and Rajamundry. On 26th July, the airline commenced its regular, non-seasonal operations with one aircraft, connecting Aurangabad, Tirupati and Rajamundry to Hyderabad. All three destinations are significantly driven by religious tourism. Aurangabad is an airport very close to a religious destination – Shirdi. The airline stopped services to Chennai from 26th July. Presently, the airline operates a double Hyderabad-Tirupati service, and single Hyderabad- Rajamundry and Hyderabad-Aurangabad services. With this, the airline operates 8 flights a day, clocking 10:20 hours of utilisation with turn-around times of 25 minutes. Average block time is 1:20 hours, and average sector distances are 220NM. With such sectors, the aircraft can be pushed (subject to commercial and operational viability) to fly a maximum of 10 flights a day with a utilisation totaling a little over 13 hours a day. However, the present utilisation is good for a startup airline. The second aircraft is expected to be operationally ready in a week’s time, and will fly sectors out of Chennai. At the time of research, Trujet’s frequency between Hyderabad and Tirupati, both ways, is twice daily, against 6 flights onward and 8 flights on the return. Aircraft deployed on the sector are in the 70-80 seat category including Air Costa’s Embraer E170s and SpiceJet’s Q400s. 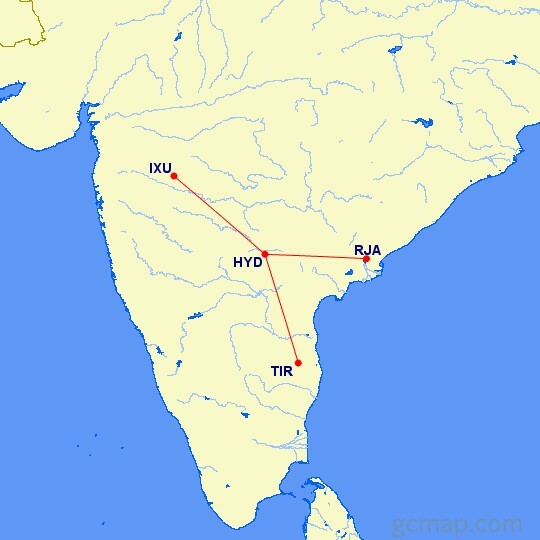 However, Air India deploys 172 seat A321s and 48 seat ATR 42s on that route. On the Hyderabad-Aurangabad sector, Trujet enjoys a monopoly. On the Hyderabad – Rajamundry sector, Trujet’s single frequency competes with SpiceJet’s 1 onward and 2 return frequencies, and Jet Airways’ three frequencies either way. While SpiceJet deploys its 78 seat Bombardier Q400s on the route, Jet Airways deploys ATR 72-500s. Difference in speeds between the two types result in only 5-10 minutes of block time difference. The airline offers a transit (no change of flight) service between Tirupati and Aurangabad via Hyderabad. A flat 4% sales tax on fuel (in comparison to upto 28%) for aircraft operating scheduled serviced with less than 80 seats, and a waiver of airport charges for aircraft of such weight category will keep direct operating costs at Trujet lean. The operating economics of the ATR 72, which is best suited for such mission lengths, will further contribute to a lean operating structure. Maintenance of the aircraft is carried out in house at Turbo Aviation’s maintenance facility, which has an approval for the aircraft type. The airline has a very simple fare model that has 13 active fare buckets. Fares for all sectors in corresponding buckets are the same fare, whether a direct or a hopping flight. There seems to be no discounted one-way fares for return flights. Adaptation to sectors that are higher in demand or longer is achieved by erasing lower fare buckets. The first 9 buckets are in flat INR 500 increments, and the last 4 buckets are in increasing increments. The airline will reportedly offer 10% discount for senior citizens, students below 18 years, members of the South India Artistes’ Association and those from the film fraternity. Trujet may become the only airline in India to offer a comprehensive travel solution. To cater to passengers whose wish to be connected to cities or towns that do not have an airport, the airline plans of introducing Volvo bus services that pick up passengers to drop them at the airport, and pick up passengers from airports to drop them at their actual destinations such as Shirdi. The airline reportedly plans to assume full responsibility of baggage handling at the bus pick up point, the airport, and the bus drop point. The airline reportedly offers a complimentary in-flight meal. The airline has reportedly identified 18 tier-II towns and cities in the south for operations. Most major airport cities in the southern region show promise. Some of the other destinations, as made public earlier, are Mangalore, Vijayawada, Bangalore, Hubli, Vishakhapatnam, Tuticorin, Coimbatore, Salem, and Kadapa. The airline’s new destinations are expected to be announced when the second aircraft is ready to fly online, as the first aircraft’s rotation has no room to accommodate new flights. The airline reportedly has plans to increase the fleet to around 5 aircraft by March 2016. The fleet is reportedly expected to touch a size of 4 in January 2016. The airline is targeting a break even period of 12 – 24 months. This translates to a break even between Q1’17 and Q1’18. A regional model with turboprops makes for a good feeder model, and may be sustainable in low capacity high demand routes, but may saturate fast without room for growth in connectivity. The ATR 72 is ideal for sectors of upto 1:45 hrs block time. For real growth, an airline must look beyond mere regional connectivity, and will need to offer pan India, inter-regional connectivity, which is commercially and operationally viable with regional jets. The airline is reportedly taking steps towards expanding its operational territory beyond the southern region into neighboring regions, for now with its turboprop aircraft. The airline may adopt a dual-fleet strategy for a good combination of range, connectivity, and penetration. It is to be seen if the airline becomes the first regional operator to convert to a pan-India license. The Flying Engineer offered comments on Trujet to Business Standard, based on this research . Click Here to read.